Cartograms are great - but they’re not the only way of visualising geographical data. Geographically accurate maps, the same ones that humans have been charting for hundreds of years, are still incredibly useful tools. I can’t really believe that these words need to be typed - but I got thinking about this topic following a tweet from the The Weekly Standard’s David Byler‏, and the fact that geographical maps are so derided got me thinking. My own opinion is simple, but still needs saying: despite the popularity of cartograms within the data community due to their clear and accurate nature, geographical maps are often still the best way to help people engage with your geographical data. If we look at the following maps (two results maps that we created for the UK’s 2017 General Election), there is a clear contrast between them. The one on the left is a map that most of us are familiar with: a visual representation of the landmass of Great Britain. The one on the right is a cartogram: a map that seeks to make the visualisation more accurate and representative by making each of the areas proportionate to a certain metric. In this case, it’s Parliamentary seats, and therefore each area is equal - but we could make them representative of population, for example. The differences between the two maps are clear. In the one on the right, London is inflated to a greatly vaster size than on the geographical map. Conversely, Scotland has been effectively halved. 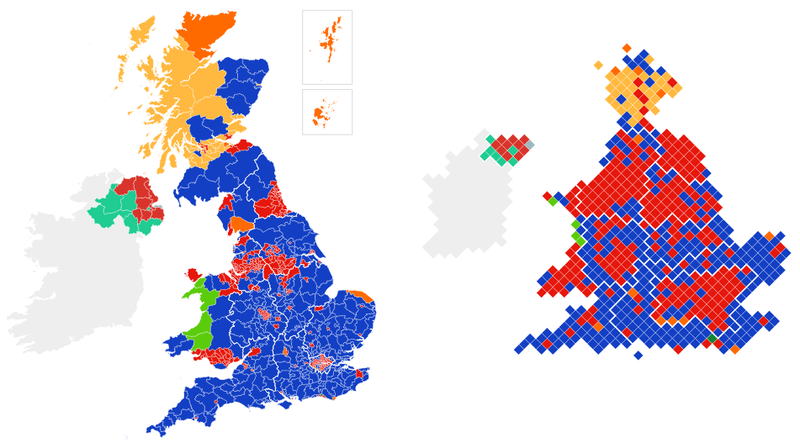 This is important as the two visualisations tell two different stories: the geographical map on the right overstates how well the Conservative Party (in blue) did. The Labour Party (in red) tends to do well in urban constituencies, which by definition have a higher population density and are therefore smaller on a geographic map. While London has a total of 73 constituencies (24 more than Scotland), we can barely see it on a normal map due to the population density of the capital city. But if we make each of its constituencies the same size, we weight each one equally - regardless of the geographical size. Such a cartogram makes sense in this case, because in the UK’s parliamentary system, each seat is worth one MP in Parliament. Seats are the only thing that matters in this vote, and each one is equally important in Parliament, and so therefore making each one be the same-sized diamond helps people understand this story. They are all the same, and should be presented as such. So far, so good. We should all be able to understand why weighting each constituency to be the same size is useful. Likewise, weighting areas by population size can also be handy when we are comparing geographical patterns and need to show smaller, dense areas. But there are many reasons why geographically-representative maps are also important. Going back to David’s original tweet, I understand why he says that this opinion is “unpopular”, but it really shouldn’t be. It simply comes down to audience. The simple fact is that many people get maps. This isn’t only because people can find themselves on a geographical map - but because people understand the visual representation of space shown to them in a graphic that resembles maps that they’ve been looking at for their entire lives. FT data journalist John Burn-Murdoch said in reply to David that it “depends entirely on how you're prioritising the many different functions of a choropleth map” - which is correct. Lots of people seem to think cartograms are simply "better" than unadjusted geographic choropleths. Many times, the primary function of our maps is to help people understand the world around them. If they do not understand a cartogram, we are not doing our job. Instead of a recognisable geographical map, cartograms are harder to comprehend. This doesn't mean that we shouldn't make them - but to profess that we only create cartograms can be elitist, catering merely for data literate audience. In the long term, better education is needed to help boost comprehension of statistics, visualisation and general data literacy. While we don’t have that, it’s important to make a compromise. That compromise is to both assist engagement and understanding of graphics, while also producing accurate and honest visualisations. Which is exactly what we did at The Telegraph when it came to the General Election. We had a toggle option to switch from a geographical map to a “proportional view” on our results page. The default was a geographical map, as all our readers would understand and (hopefully) engage with that. Then, if they wished, they could click a button to morph the map into a cartogram - allowing them to understand the wider context of the election and how close it actually was.